Prova tutto ciò che Barcellona ha da offrire durante questa escursione di 8 ore nella capitale catalana. Inizia lungo l'elegante Passeig de Gracia, esplorando le boutique di lusso e gli edifici modernisti come La Pedrera e Casa Batllo. 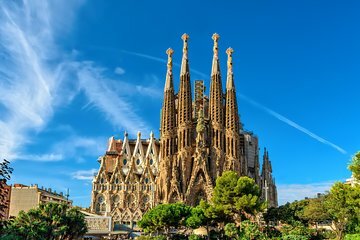 Continuerai la giornata nella Sagrada Familia, dichiarata Patrimonio dell'Umanità dall'UNESCO, imparando l'ispirazione per questo edificio sbalorditivo e il suo creatore unico nel suo genere, Antoni Gaudí. Ti piaceranno anche le visite ad altre attrazioni iconiche come Las Ramblas, Montjüic Mountain, il Quartiere Gotico e molto altro. Sono inclusi anche il trasporto di andata e ritorno e una guida. Paying extra for entry to Sagrada Familia a ripoff, or I would have rated this 5 stars. Guide Miguel terrific--patient, flexible, knowlegable. Would have been truly comprehensive if Park Guell were included. We went walking through old castles and courtyards and churches, and saw the Roman impact on the city. There are some amazing rabbit warren streets around, with great little shops and food vendors tucked away. There is some significant modern history, too, which was interesting. We had time to find our own lunch prior to visiting La Sagrada Familia. Take the time to find your tour guide, or you'll miss a lot of detail as the church is busy and beautiful. The stained glass is out of this world - afternoon is the best time to see it. I only wish this included the park with all the mosaic animals. Absolut lohnenswert. Individueller Guide Kurt lieferte super Hintergrundwissen zur Geschichte der Stadt und vielen anderen Dingen. Sehr empfehlenswert. Amazing. Not to be excluded from your trip to Barcelona. Before leaving home, my wife got injured so I didnt book the original tour that we were thinking of. Instead I booked this private tour through Viator. They contracted with a local tour agency I believe was explore catalunya who in turn hires a private contractor. Her name was Gloria and she was FANTASTIC! She has a business, Tasguides - Its travel time. She adjusted the tour perfectly to handle our needs. She is very knowledgeable about the area and the history, speaks English very well. When we broke for lunch we invited her to join us and that was great experience. She recommended a local place and recommend local tapas that we all enjoyed. Had a wonderful conversation and learned so much more about the Catalan and Spanish cultures. A wonderful experience. We saw all the sites that we wanted Sagrada Familia, La Rambla, the market, Gothic Quarter, Montjuic, Plaça de Catalunya, Columbus Monument, the port, the beaches and many other things and she let us spend as much time as we wished. Wonderful, excellent tour. Highly recommend it. Overall this was a great tour, however, the title is misleading. Barcelona Comprehensive Day Tour with Access to Sagrada Familia...... to view it from across the street? The tour doesn't include the ticket to visit Sagrada Familia. For the money we spent, this should have been included in the price. Very disappointed! The tour and our guide Rubin were both excellent with Rubin not only showing us the highlights of Barcelona but also taking us wherever we wished to go. He would drop us off if we wanted to wander around at any specific spot, and was always where he said he would pick us up at the appointed time. The highlight of the tour of course was the Sagrada Familia where we could have spent hours taking in the breathtaking beauty of the cathedral. Gaudi was an artist/designer/architect at least a hundred years ahead of his time. Having advanced tickets allowed us to enter immediately at our reserved time and ahead of the lineup. The only reason we gave it a 4 out of 5 stars was because the car my wife and I were transported in had seen its better days, being slightly beaten up and could have been cleaner. We had Tatiana (and her husband as the driver) who was lovely, very accommodating and great sense of humour. It was just us and another couple so was very intimate.